The post eCommerce Keeps Fueling Fashion Retail Growth appeared first on Cin7. As Xero retires the role of Head of Bookkeeping, Mel Power reviews her nearly four years in the job. Mel will be continuing her work with the bookkeeping community as part of Xero’s global partner team. September 29 in 2014 was a memorable day – and one that I remember distinctly. It was the day I started my journey with Xero Australia as head of bookkeeping. It was also the day I started my journey with James Solomons as head of accounting – and what fun we’ve had, Jimmy! I felt an incredible sense of pride as I boarded the plane bound for Melbourne. Thinking about the opportunity I had to represent my beloved profession of bookkeeping – a profession that had provided for my family, given me lifelong friends, and helped me make lasting connections across Australia and around the world. It was also a profession that enabled me to do what I was most passionate about. I wanted to help small business owners be successful and create businesses that were vehicles to help them achieve their life goals. One of the key things I was engaged to do in this role was to be the voice of the bookkeeping industry back into Xero. I helped to champion the value that bookkeepers bring to small business. My mission was very quickly formulated by a challenge that Rod Drury threw out at Xerocon 2014: to help bookkeepers double their income. The Grow Your Practice series for bookkeepers was born in April 2015. Here’s the short video of Rod and I launching the concept. The series was so successful that the first round was just the beginning. Statistics show that those who went through the initial program increased the size of their businesses by 47 percent within six months. So we ran another three series, live workshops at Xerocon Uni Day, and created an on-demand series so that bookkeepers could participate when they wanted and connect with each other through the Xero community. The series was also picked up by our head of accounting James Solomons. He then created something unique for our accounting partners by adding guest presenters from the industry. This was particularly great in the live Xerocon sessions. It was such a privilege to be able to walk with our bookkeepers on this journey and see their success. Many people from this very first series have since gone on to be recognised as Xero Bookkeeping Partners of the Year, regional winners, and have also become members of XPAC, the Xero Partner Advisory Council in Australia. It’s been incredibly inspiring to see this happen! By late 2015, I was travelling to other regions, including Canada, the UK, the USA and New Zealand. I started speaking at bookkeeping events about the importance and future of the profession. During these travels, I met so many fantastic people working as bookkeepers, and others that were really invested in the industry. My mind was ticking over how I could connect all of these people together and keep these great conversations happening. Enter the power of Facebook communities. 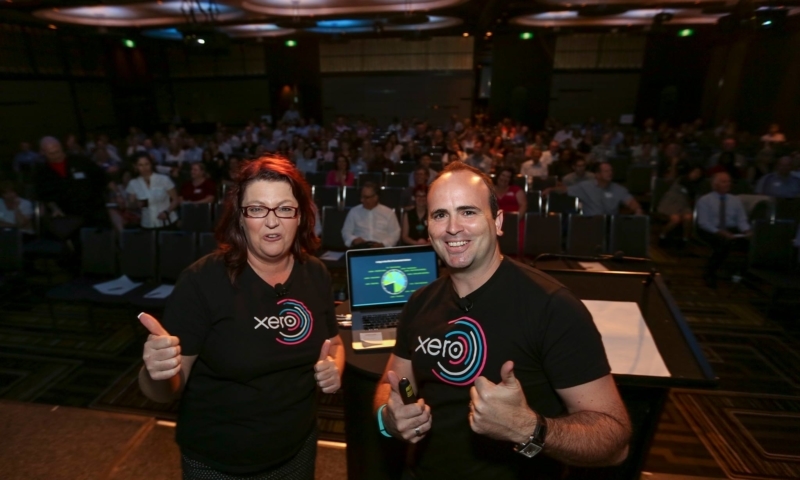 At Xerocon 2015, I created the first Xero Facebook community for bookkeepers in Australia. This group has become a fabulous place for our bookkeeping partners to connect, collaborate, share and support – not only in business but also personally. The community has rallied on many occasions to help each other. One scenario that has stayed close to my heart is when one of the husbands of one member became seriously ill. The entire community rallied and provided emotional, financial and practical support to her. Now that’s human. That’s really living the values of what we stand for at Xero. The success of the Facebook community in Australia led to the creation of other communities around the globe. Whether in regional or global groups, we see the same community spirit and collaboration occur with work referrals across the region, business-to-business deals, and friendships created and solidified. We’ve seen natural leaders arise, such as those in XPAC. I honestly never dreamed of how powerful this spirit of community could be! In four years, I’ve seen our bookkeeping community truly stand up and be counted for the value it provides to small business. I’ve seen bookkeepers smash their business goals and make big decisions around the future of their businesses. And I’ve seen collaboration between the entire profession, with bookkeepers really stepping forward to transform small business. My role at Xero started out in 2014 as a super advocate and champion for the bookkeeping channel. It’s now 2018 and I can proudly say that our Xero bookkeeping partners are a voice to be reckoned with. They are passionate about the value they provide. They are also prepared to stand strong and tall for what they believe in. This incredible group of self-advocating people no longer require a champion within Xero. Instead, they stand together in a clear voice and are absolutely heard. The community we have created as a platform for this voice works brilliantly. So, with my hand on my heart and some tears in my eyes, it’s time for me to step down as the Head of Bookkeeping in Xero Australia as this role has been retired. I will be staying on with the Global Partner team until 30th June to assist in transitioning our new role Head of Community in AU and to complete existing engagements. The post It’s been a blast: Mel Power reflects on the Head of Bookkeeping role at Xero appeared first on Xero Blog. As Xero retires the role of Head of Accounting, James Solomons reflects on his proudest achievements. As of June 2018, James will continue to support the industry in the multiple ways he has done over the past 10 years. In May 2014 after the Xero roadshow, I wrote a blog. It challenged Xero to take responsibility for the disruption it was bringing to the industry (for the better). Little did I know that this blog would start a chain reaction of proportions I could never have imagined. I had spent the better part of five years writing about industry change, and the issues facing small businesses. 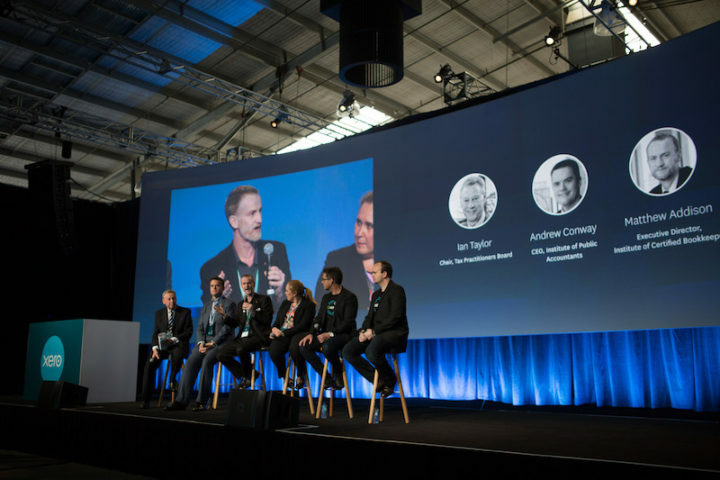 I’d shared my thoughts on panels at Xerocon and at roadshows. 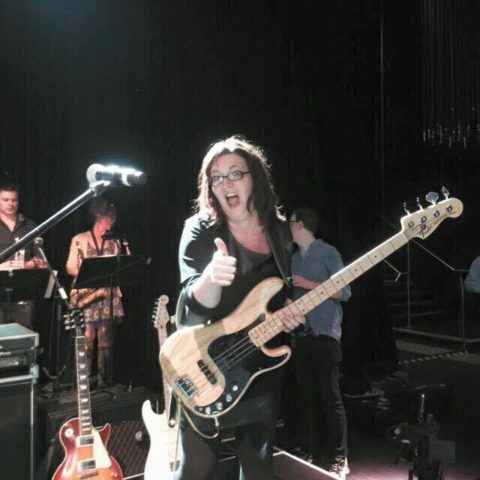 I had played in the Xero All Stars band, and worked closely with the Xero team to help the platform better serve accountants, bookkeepers and small businesses. 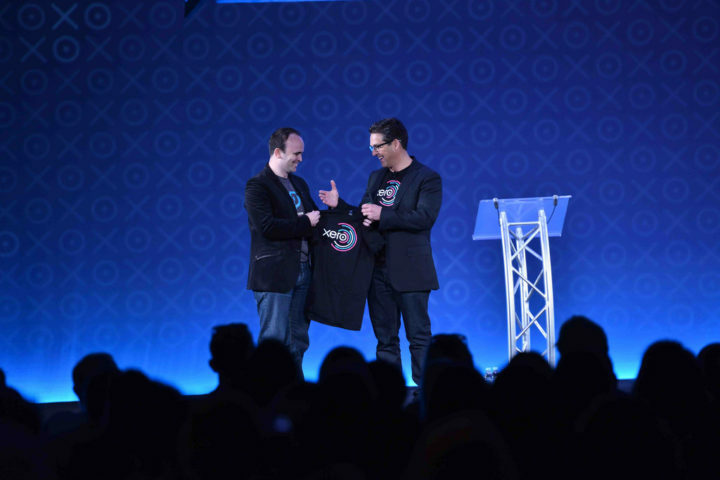 I like to say that I was – and still am – one of Xero’s biggest fans and its biggest critics. And for good reason. I knew something special was happening and I wanted to be part of it. When I was eventually offered the role of head of accounting by Chris Ridd, supported 110% by Trent Innes, it was an easy yes – despite all the mountains I needed to move to make it happen. I told my business partners at the time. I told my wife and two young kids that life was about to get really busy. Then I reduced my commitment to a flourishing accounting business down from full time to two days a week. And I started working for Xero three days a week. All the while, I knew in my mind that they would both be full-time roles! But it was something I knew I needed to do for our profession. Where my articles had been making a small positive impact on my peers, I knew with the force of Xero behind me that we could help so many more accountants and bookkeepers find ways to survive and thrive through digital disruption. At a time when our professional bodies were still grappling with the cloud, the industry was moving forward in leaps and bounds. It was leading the globe with its adoption of technology as true innovators in the accounting space. And that’s why today, as Xero announces the retiring of the role on 30 June, I can safely say I’m going nowhere. The acceptance of a formalised role was not about doing things to become an industry leader. Or working towards finishing a project and then moving on. Our industry is defined by constant change, and the job of improvement will never be done. I will still write articles and blogs, and have an opinion on industry issues. I will still speak at events, lecture at universities, and share my experiences with anyone who takes the time to reach out. And I will still support the Xero partner community, the accountants and bookkeepers in Australia and around the world, as I’ve always done. Because that, to me, is what it has always been about – sharing our wins and losses with our industry community so that they may benefit others. So in that same spirit, I wanted to share some of the achievements in the role that I’m most proud of. I worked alongside Mel Power who was head of bookkeeping. It was clear to us that our industry needed a strong community to find ways to support itself moving forward. Working together – whether face-to-face, online, via conferences or workshops – is the best way to benefit from the experiences of others. I was never going to tell an accountant how to invoice, manage workflows or run their practice. Rather, I would help build a practice framework that accountants could absorb and adapt as they pursued their own business goals. Building online groups, launching Accelerate and then Grow Your Practice for accountants, and working with the Xero territory managers to build the skills of Xero’s frontline teams has been a satisfying way to bring proactive support to our partners. If you can leave an organisation in a better position than when you joined it, then you’ve done your job well. Xero’s practice tools are world class and take the accumulation of years of experience from many people. Consider Xero Tax, which has mapped out the features required and changed many times. Anthony Migliardi and Matthew Prouse continue to push the boundaries of the product. They couldn’t do so without understanding and representing the views of current and potential users, like yourself to the product designers and developers. The uptake of Xero Tax speaks for itself with regard to the success of the early days of planning, listening and developing. As Xero has talked about before, deciding what will to build when remains a constant challenge. The decisions are based on many contributing factors – including you. So continue to stand up for what you need to see developed, and know that you have many ways to share your views. Speak to your territory manager, speak to your account manager and reach out to the Xero Partner Advisory Council (XPAC) and XPAC alumni. As industry leaders, innovators and award winners, their role is to be a voice of support for you when you need it. Being able to help build this network to enhance the Xero community has been a great achievement. In the new world of shared data, where ownership lines are blurred, the development of the partner code of conduct has become one of my proudest achievements. It was the first of its kind globally. Whilst maybe not loved by all, it was a necessary step borne out of a lack of industry guidance and regulation. Over a 10-month period, we worked with every industry body and the Tax Practitioners Board (TPB). We formed a unanimous view about how we as accountants and bookkeepers should operate in the best interests of our clients. It was no easy feat. But it proved that our professional associations could work together when needed, to solve the industry issues that impact us all. As Andrew Conway said back in 2015 at Xerocon, “This process brought the issue into the limelight and will lead the way for further work in this area at an industry level”. The subsequent development of industry-wide guidance notes by the TPB and respective professional bodies proved how important this process was. It was a privilege to take part in the budget roundtable that Xero ran in 2016, and share the views of small businesses and their advisers alongside Mark Bouris, Ben Heap, John Ball, Heidi Armstrong, Mel Power, Trent Innes who was Xero’s newly appointed MD, and the Business Insider team. 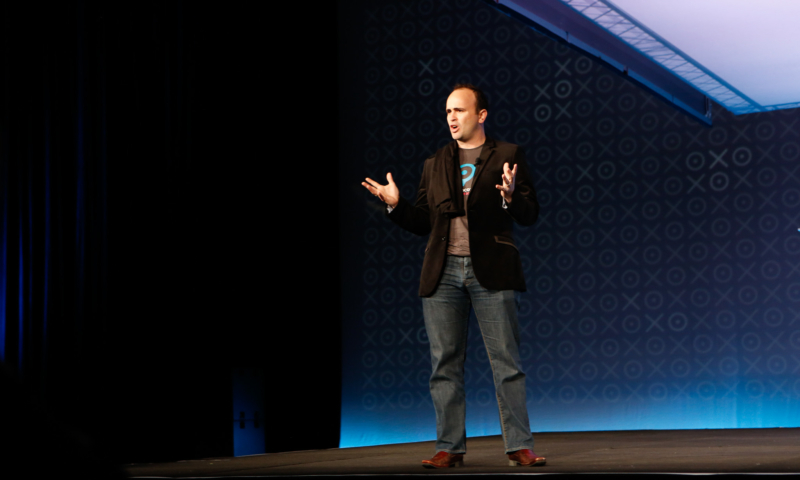 The event was a snippet of what was to come, as Xero began to increase its advocacy in the small business space. Lastly, but certainly not of least importance, the opportunity to work closer with our industry bodies over the past three and a half years has been a real highlight. Our industry can only move forward if its professional bodies present a united front. I’m hopeful that the sometimes difficult feedback that Mel Power and I have been able to share, thanks to our honest relationships with Xero partners, will continue to drive change. One personal reason that we join any organisation is to reap the benefit of working with great people. Joining the Xero family has helped me to build long-lasting personal and professional relationships that I will never forget. I’ve been very lucky to have worked with so many talented, committed and amazing people. That list is too long to even consider naming them all. But I must thank Rod Drury and the Xero co-founders for starting this little tech company across the ditch 12 years ago, and Chris Ridd for giving me the opportunity. Xero has changed so many lives, including mine. Thank you to my fellow accountants, many of whom I now call friends, for their continued support. Thank you to my business partner Rebecca Mihalic for coming in and taking the reigns at Aptus; its success is solely a result of her commitment to the business. It also goes without saying that I need to thank Mel Power for being my ‘credit’. And lastly thank you to my wife Jade and my kids for supporting me through the the craziness. In all honesty – it’s not about to end as there is still so much work to do! I thought it would be fitting to reproduce a snippet of the notes I jotted down the day before my announcement into the role at Xerocon 2014. Because the privilege that it was then is as true today. I am your voice into Xero. I am your voice into industry. I am your voice into the associations. I am your voice into government and the ATO. I am your voice to the wider market and population. I’m here to make sure businesses owners realise that we still have an important role to play in a system which is moving to automation, and where a government is committed to reducing red tape for small businesses. But it requires change from all of us. I am very passionate about our industry and committed to ensuring that all of your training and hard work to start and build a practice and to get clients onboard isn’t undone by what I believe is one of the greatest things to happen to our industry. I want us all to prosper from the disruption by being able to leverage our expertise and professional skills to deliver true advisory solutions to businesses across Australia. In closing, I am truly humbled and very honoured to take this responsibility and I am ready and excited to begin the challenge. I look forward to speaking with many, if not all of you, as part of this journey. The post From the Xero band to the budget roundtable: James Solomons reviews his time as Head of Accounting appeared first on Xero Blog. Running a cash-positive small business means cutting costs wherever possible. While reducing overheads and forecasting for seasonal activity are great ways to manage your cash flow, evaluating your suppliers could be the perfect way to save extra money and streamline your vendors. Here’s an essential checklist for reviewing your suppliers and getting a better deal. Are you working with the right suppliers? Before you start thinking about auditing your vendors or negotiating for a better deal, put together a complete list of your suppliers and then review whether they are providing everything you need. Are your suppliers experienced in the retail market? Do they provide consistent, high-quality products or services? You might discover some suppliers aren’t a good fit for your business – even if they were when you first started working with them. Beyond that, think about your relationships with each vendor. Are there ways to improve them? According to Inc.com, one of the most common mistakes for small business owners is that they have “a combative relationship with their suppliers and vendors”. So instead of slipping on the brass knuckles and trying to fight for a better deal, consider whether maintaining a good relationship is more important. After all, a happy supplier is more likely to be considerate if you ever run into cash flow troubles. Is there any overlap across suppliers? Once you have a list of all your suppliers and understand exactly what they provide your business, you’ll be able to see whether there is any overlap between them. Noticeable overlap means you’re spending more money than you need to, so it’s a good idea to speak with your suppliers if this happens. Cost: The price of your suppliers has a huge impact on your profit margin, so while you always want to use the best people, you also need to consider how much they charge. Asking your suppliers to sell in bulk could be one way to cut costs on expensive orders. Delivery: This involves not only whether your suppliers deliver the good on time, but also whether they deliver the right Are there ever mistakes in deliveries? Would an integrated solution fix any issues throughout the supply chain? Flexibility: Can your suppliers accommodate your needs on a long-term basis? How flexible are they if unpredictable issues crop up? What would happen to your business if they suddenly had to close for a period of time? Quality of services: While the quality of the product itself is crucial – for you and your customers – equally important is the quality of the people. You have to deal with your suppliers on a regular basis, so it helps if everyone you deal with is friendly and flexible – from delivery drivers to the accounts department. Can you get a better deal? Small business is competitive no matter what industry, but running a retail business means staying on top of every part of how the store runs. So why not try to find better deals where you can? Your employees can actually be super helpful at this stage. Most of them probably interact with your vendors throughout their work weeks, so they are hubs of information that can help you evaluate your suppliers on a deeper level. Ask your team – either in-person or online with a communication solution for your small business – about how many times they’ve had to scrap or return products because the supplier didn’t meet expectations. Have there been any customer complaints because of a bad product or service from your vendors? If you still want to retain the supplier, this is a golden opportunity to negotiate a better deal. Your suppliers provide the bread and butter to your retail business, so it’s worth staying on top of them to ensure you always have the best people helping your business succeed. 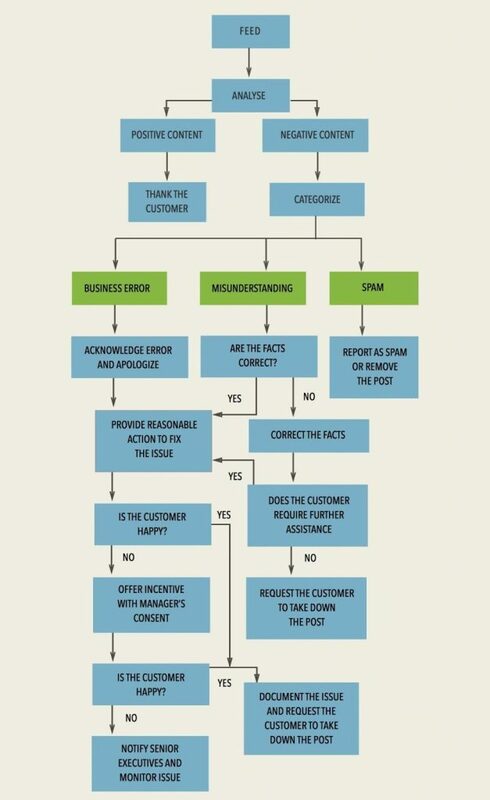 The post Evaluating your suppliers: An essential checklist appeared first on Deputy. Running a franchise business means you get plenty of benefits that start-ups often miss out on – a recognisable brand name, a deep support network and plenty of tools for ongoing success. But growing your business often requires stepping outside the franchise’s constrictions. In order to reach a wider audience and tap into an internet-savvy customer base, you need a marketing strategy for the modern era. Here are four ways to get started. While some might argue there are problems with focusing on a niche audience, the benefits far outweigh any negatives. The first step is understanding what it is you offer than none of your competitors can match. That is the reason a core group of your customers keep coming back to your franchise. So why not take advantage of it? First: Figure out your niche. Next: Focus all your marketing efforts on that audience. Finally (and most importantly): Offer them something they won’t be able to pass up. Email marketing is one of the best ways to make this happen. Similar to avoiding a spray-and-pray approach to marketing, it’s wise to focus on one social media platform rather than multiple. It’s fine to have general accounts on all the big players – Facebook, Instagram, Twitter and maybe even LinkedIn – but you need to prioritise where your best audience is active. Don’t waste your free time trying to juggle every social platform with daily updates. Instead, focus on the one that provides the best ROI – maybe you have far more followers on Instagram than Facebook, or perhaps your Twitter promotions deliver more sales conversions than LinkedIn blogs. Whatever you decide, spend 90 per cent of your ‘social curation’ time on the platform that will reach the biggest audience. Want to spend time with the family but can’t tear yourself away from the necessary admin tasks? Consider utilising workplace solutions that can give you back that much-needed downtime. Need to organise rosters for next month? Struggling with time billing and wage compliance? An online tool can streamline all these tasks and more so you can focus on what’s really important: growing your business. Falling into a day-to-day rhythm is a common problem for small business owners. After all, how often do you think about a particular customer beyond their most recent purchase? Recognising what your customers’ lifetime value (LTV) is can turn the sales funnel on its head. It allows you to restructure your business approach so you accommodate your customers over the long term, not just the now. Consider your upsell process. What – if anything – happens after a customer purchases something from you? What are your online and offline communication strategies? Is there a system in place for referrals? If you answered no to any of the above, you haven’t considered your customers’ LTV. Once you understand it, you can turn them into customers for life. Taking care of the heavy lifting is vital for independent franchisees, but it’s also important to take the time to think about growing your business. There are countless ways you can reach new audiences without being limited by your franchise. Something as small as an online workplace solution can give you the time to update your growth strategy and set the wheels in motion. The post 4 marketing hacks to help grow your franchise appeared first on Deputy. 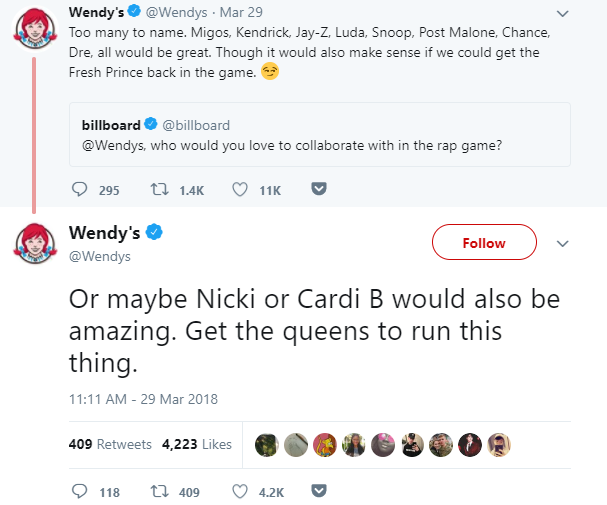 If awards were handed out for the king and queen of social media last year, there’s no doubt that Wendy’s would take the crown. The fast-food chain stepped-up its social media game in 2017 by exchanging banter with followers and ‘trolling’ its competitors. Anyone taking a look at Wendy’s Twitter might be mistaken for thinking that they have accidentally landed on the page of the chat show host who’s also the fast food restaurant’s namesake. That’s because the sassy language, quick wit, and references to pop culture wouldn’t be out of place on The Wendy Williams Show. Net income was $159.3 million in the fourth quarter of 2017 compared to net income of $28.9 million in the fourth quarter of 2016. Net income was $194.0 million in 2017 compared to net income of $129.6 million in 2016. Wendy’s experienced a 49.7% growth in profit from $129.6 million to $194 million for the year. Additionally, for the first time ever, Wendy’s sales exceeded the $10 billion global sales target for 2017. Sales aren’t the only aspect of Wendy’s experiencing growth. Wendy’s Twitter following has increased from 2.1 million to over 2.4 million in six months. The chart below, courtesy of socialbakers.com, shows how Wendy’s following has been growing consistently. 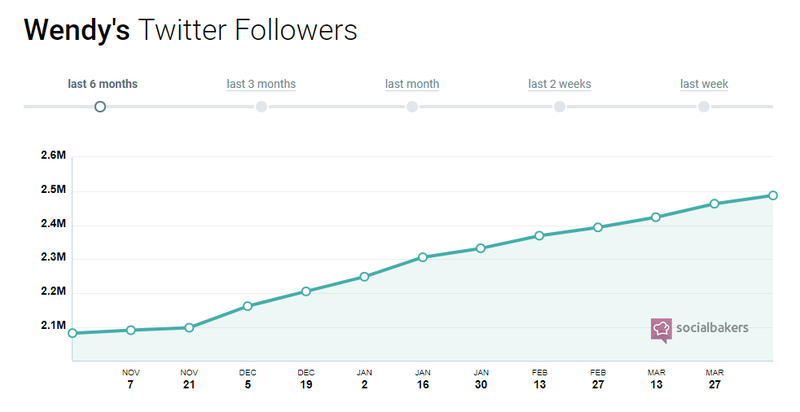 Twitter followers can be considered a vanity metric if no one is interacting. Engagement is where Wendy’s shines as their posts usually get over 10,000 shares and more than 30,000 likes. So, how did Wendy’s emerge as the restaurant that dominated social media in 2017 and, more importantly, how can your restaurant follow suit? We’ll take a look at the main ingredients of Wendy’s winning social media strategy and also show you there’s no ‘secret sauce.’ Any restaurant can apply the same techniques to boost fans and sales. Wendy wasted no time in responding and set a challenge that 18 million tweets would secure a year’s worth of free chicken nuggets. The #NuggsForCarter was born, went viral and became the most retweeted Tweet of all time, knocking Ellen DeGeneres’ famous Oscar selfie tweet off the top spot. 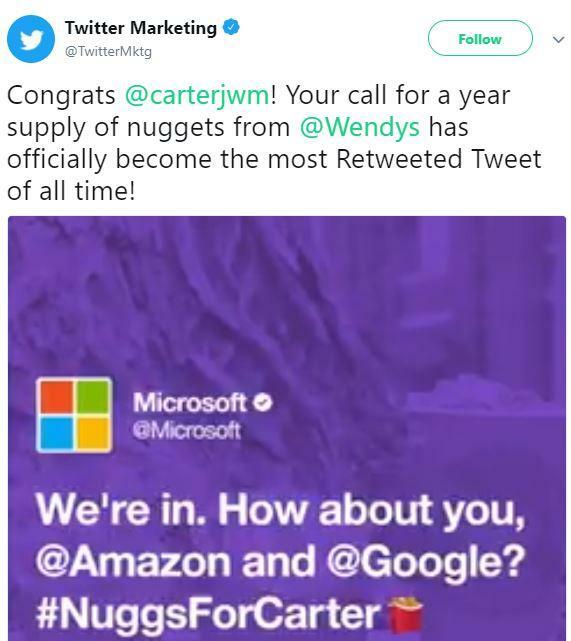 #NuggsForCarter was retweeted 3,432,218 times and gained support from industry heavyweights, like Apple music and Microsoft. Ellen DeGeneres even mentioned the nuggets ‘campaign’ on her show. 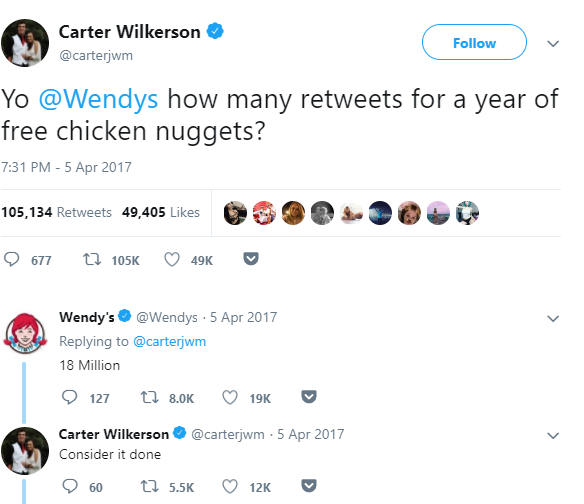 Although Carter fell short of the 18 million retweet target, Wendy’s still awarded him a year of chicken nuggets for the excellent effort. 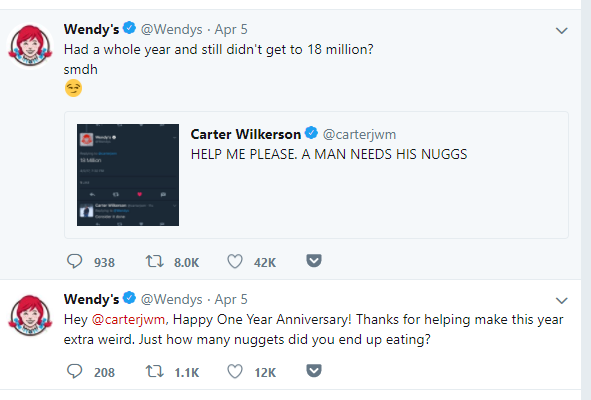 In the world of social media where things get forgotten in an instant, the nugget challenge still lives on, with Wendy’s mentioning the nuggets challenge a year later and still enjoying a high level of engagement. Social media is a great way to address customer service issues. It’s not unusual for customers who have had a negative experience at your restaurant to tweet about it. If your social media pages are only filled with promotional dishes, any customer complaints will stick out like a sore thumb. Take every opportunity to respond to customers’ comments and questions, especially when they’re complimentary. 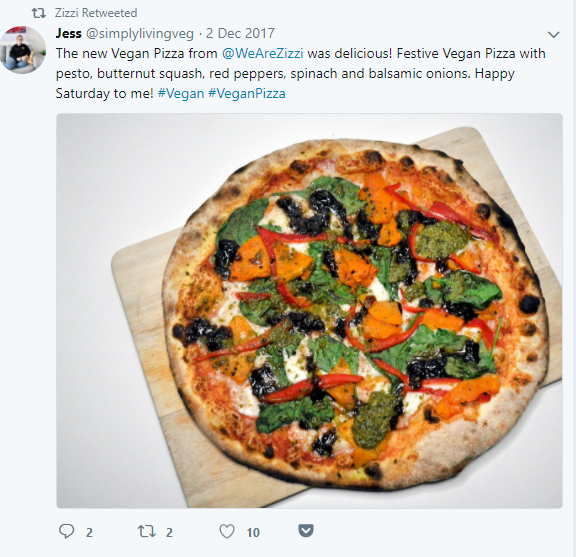 The example below is somewhat of a wasted opportunity by the UK-based restaurant, Zizzi. A retweet was good, but imagine how great this follower would have felt if they received a personalized response to their complementary tweet. Where possible, personally responding to followers makes them feel like your restaurant appreciates their custom and wants to relate to them as people. Wendy’s nailed the art of conversing with its followers by responding to queries that often have nothing to do with customer service. 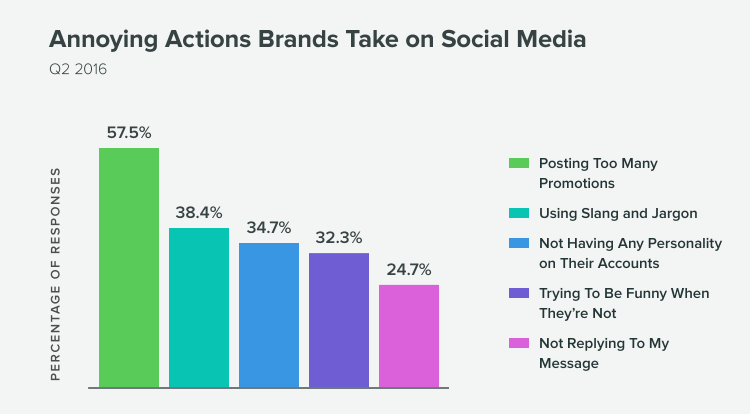 Research by Sprout Social found that the most annoying action taken by brands was posting too many promotional posts. Learn from Wendy’s approach and break-up the “hey, look how great our food is!” posts with those that facilitate human interaction. Wendy’s may not have been exposed to an extra three million people, including national press if it hadn’t responded to Carter’s question about free nuggets. Imagine what meaningful interaction with your followers could do for your restaurant. 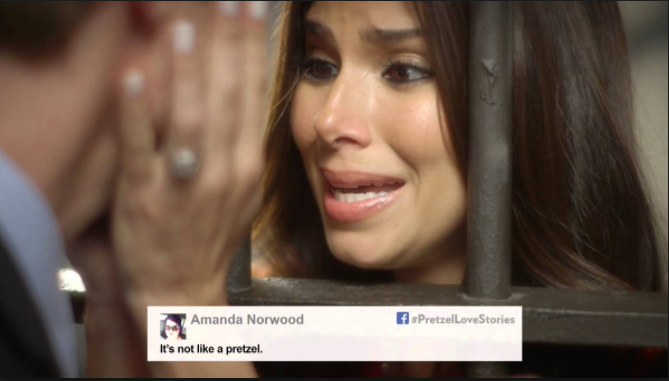 Wendy’s #PretzelLoveStories was rolled-out to introduce its Pretzel Pub Chicken sandwich. The campaign involved actors reading out customers’ tweets about the new sandwich in a silly, soap opera style. These stories were produced in 2013 and show the power of storytelling, especially when humor is involved. The first installment of the story collected thousands of comments, views, and shares. Wendy’s YouTube channel also shares stories about different aspects of its business, like how it sources products and also how its competitors use frozen beef. The frozen beef story has received over five million views so far. To use storytelling effectively in your social media marketing, think about what makes your restaurant unique. Some of Wendy’s stories are based on the fact that they use fresh beef while their competitors opt for frozen. Do you have an interesting story to tell about your restaurant’s history or your staff? Your storytelling can also center around local events. Small restaurants that don’t have the budget to shoot videos using famous actors, like Wendy’s, can tell the story of a local band or fundraising effort, like in the example below. The great thing about storytelling is that stories happen every day. The fact that a restaurant has customers means that there will always be stories to tell. 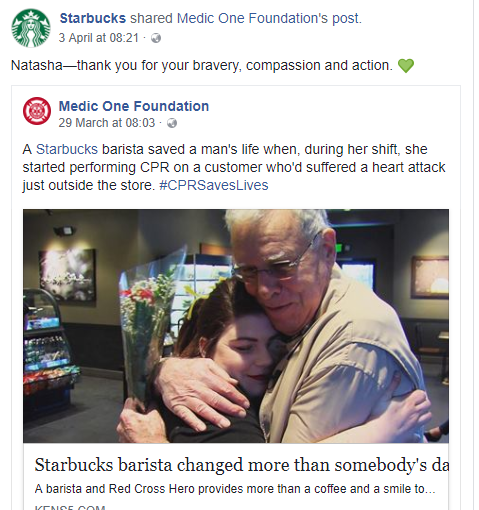 For example, Starbucks shared the story of how one of its barista’s saved someone’s life. Use multimedia to tell your stories. Disclose something personal about your restaurant. Show real customers and staff to build authenticity. Encourage your users to tell and share their stories. Wendy’s has even released a mixtape called ‘We beefin?’, and the single ‘Rest in Grease’ reached number one on Spotify’s Global Viral 50. Scrolling through Wendy’s Twitter feed, you realize that their brand voice isn’t a one-off. Their style of communicating with their audience is consistent and on-brand every time. The key to creating and maintaining a tone of voice that will resonate with your audience is to gain a deep understanding of your target market. Not every restaurant will get away with adopting a similar tone to Wendy’s. For example, eateries whose main customers are people aged 50 and over are unlikely to appreciate Wendy’s sassy tone. Decide how you want your customers to view your restaurant. Do you want to be known for traditional values or for a more modern attitude? Plan for different scenarios that can occur on social media and develop a sample response in your brand voice. Be consistent with your brand voice across all social media platforms and in all situations to avoid confusing followers. 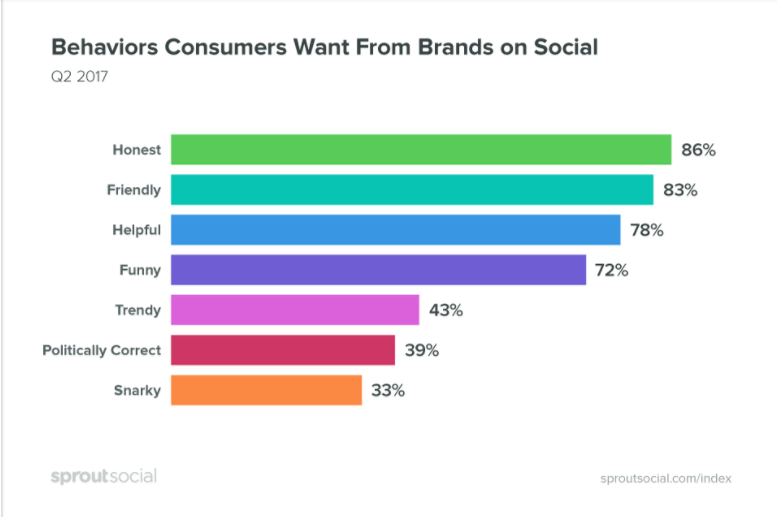 Your brand voice should make your followers feel like they have a relationship with your restaurant and, in turn, they are more likely to recommend you to their friends. 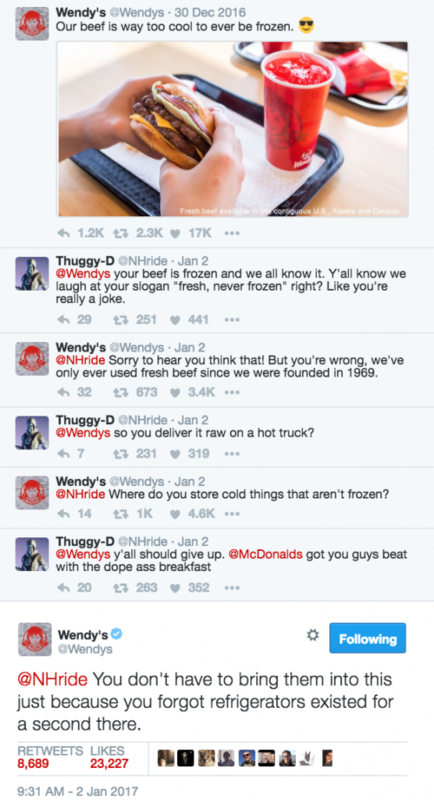 As much as Wendy’s has enjoyed success with its social media strategy, things don’t always go right. Wendy’s experienced a backlash in relation to a tweet of a Wendy’s version of an image of a character called Pepe the Frog. It emerged that Pepe the Frog was used by a white supremacist group and was labeled as a hate symbol by the Anti-Defamation League in September 2016. Wendy’s was accused of taking it’s roasting too far and many denounced its controversial approach. 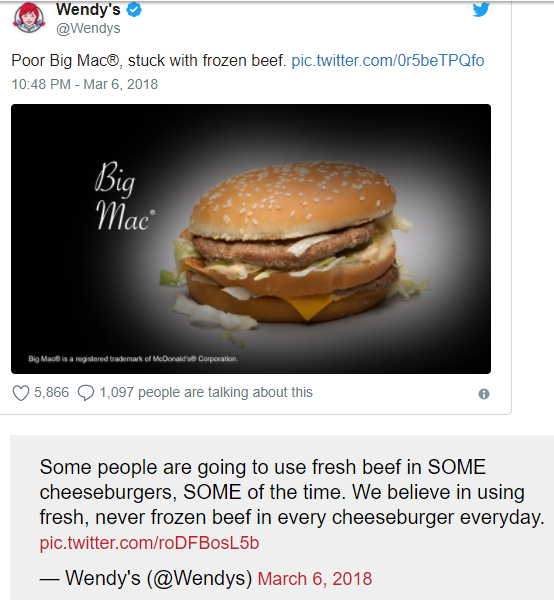 When Wendy’s realized its error, the post was quickly deleted and they issued an apology explaining that they were unaware of the significance of the image. This incident doesn’t appear to have caused any permanent damage to Wendy’s reputation or brand as it continues to use the occasional roasts to keep its audience engaged. Wendy’s isn’t the only restaurant that has caused grave offense on social media. 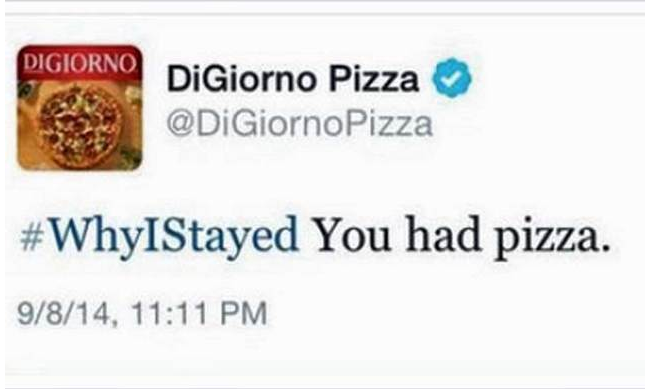 DiGiorno pizza restaurant mistakenly used a hashtag about domestic violence to promote their pizza. The backlash was understandably swift and sharp. Own up to your mistake – Once you have realized that your post has offended someone or a community, admit your mistake straight away and take full responsibility. Don’t be defensive – If you have genuinely offended people, you should expect comments that come from a place of anger, hurt and disappointment. Resist the temptation to jump in to justify your actions. Issue a formal apology – Where the damage has been caused on a large scale, your restaurant should issue the apology on all of your social media channels. Wendy’s apology advised that their community manager was unaware of the Pepe the Frog associations. Re-examine your restaurant’s policies – Review and update your social media policies and train your staff in relation to safeguarding your reputation online. Keep the conversation going – Acknowledge your followers’ feelings by speaking with them to reassure them that this was a one-off and you will be implementing measures to prevent these types of incidents happening again. 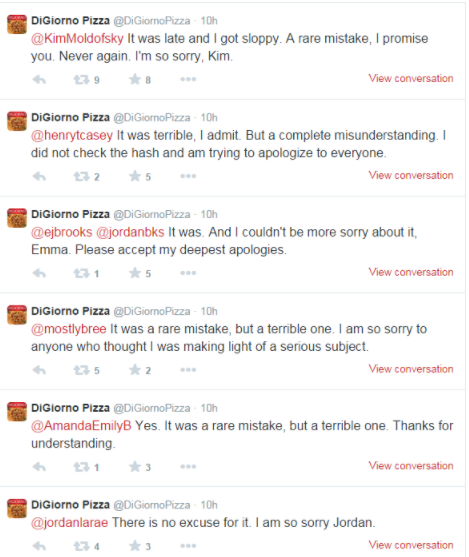 DiGiorno pizza took the step of personally apologizing to everyone who complained. 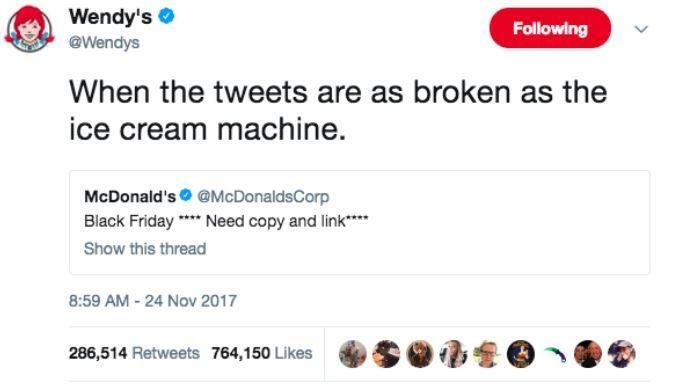 Wendy’s social media team represent the personality of the brand at every point. Wendy’s team are familiar with its voice and target audience and provide consistency across all media channels. Before you hire a social media manager for your restaurant, you need to have an idea about your strategy, including your voice. Don’t worry if you don’t have all the details, but knowing how you want your restaurant to be portrayed will help you to hire the right people. For example, Amy Brown was hired for Wendy’s after the VP of Advertising followed and trolled her on Twitter. Work with your team to identify posts that need prior authorization and give them the autonomy to interact with users to represent your restaurant in the best light. Lastly, ensure that your social media strategy and messaging is clear so that, if one of your team leaves, your followers will get a consistent voice. Amy Brown has now left Wendy’s but, despite her departure, they’re still serving up sass, roasts, and humor. Wendy’s have used social media in an authentic way to grow its customer base and profits. Your restaurant should follow suit and focus on a social media strategy to turn your fans into diners. Hungry for more tips on managing your restaurant? Subscribe to The Deputy blog for more insights like this, and schedule a demo below to see how Deputy can benefit your business. The post How Wendy’s used social media to profit $64M in a year appeared first on Deputy. 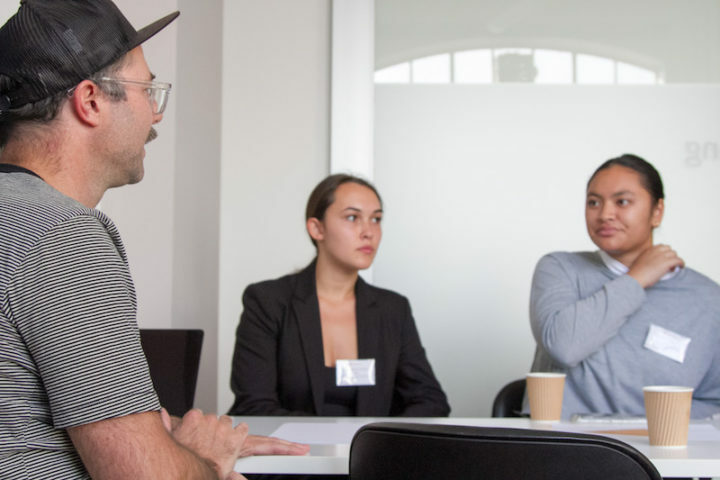 Last week Xero supported the entrepreneurial and startup community within the Pacific Business Trust by running a workshop in Auckland. More than 20 young entrepreneurs, at different stages of their startup journeys, took part in the successful event. We talk to Ruth James, Xero’s Tech Outreach and Engage Coordinator, about how this idea came about. Ruth says Xero connected with the Pacific Business Trust CEO, Kim Tuaine, some months ago. “We were very keen to find an opportunity where we could make an impact on the young entrepreneurs in this community. So we set up the Xero Lean Canvas and Ideation Workshop”. “Kim is incredibly passionate about supporting the startup community, and she has a background in founding and running successful companies. She brings a wealth of knowledge and experience that she can use to support and grow Pasifika startups and entrepreneurs. The Pacific Business Trust provides a platform where she is able to do just that and it was amazing to be involved”. Xero strives to have a positive impact on the world by helping small businesses grow and succeed. Creating this workshop with Kim and the Pacific Business Trust seemed like a natural step, to inspire the next generation of entrepreneurs. There was a great energy to the day. The first half of the workshop consisted of a number of talks and presentations, which covered Xero’s mission and purpose, key projects and a deep dive into Lean Canvas. The second half saw participants take part in a ‘speed dating’ session with some of Xero’s subject matter experts. This allowed the attendees to gain a breadth of valuable knowledge about different areas of the business. Many praised this as the highlight of the workshop. Ruth says the day benefited everyone in a different way. “Some were at the beginning of their journeys, but had prior skills that they wanted to exploit. However, some were already running well-established businesses and looking to branch out with new services and products”. Between Ruth’s engagement with the entrepreneurs, valuable insight provided by the speakers, and networking opportunities, everyone left the workshop with a smile on their face and a new outlook on doing business. The post Supporting the startup community within the Pacific Business Trust appeared first on Xero Blog. Do Your Customers Want Supply Chain Visibility? The post Do Your Customers Want Supply Chain Visibility? appeared first on Cin7. Finding a retail space for lease can be challenging, especially given that the wrong move can have catastrophic consequences for your business. Competition for the best location is high, so you should be prepared to make some concessions for elements that aren’t deal-breakers. The process of finding a retail space to rent will be less frustrating if you have a solid plan that includes your objectives and must-haves. Convenience – You should expect to pay more for a lease if a shop for rent is located in a convenient place that includes other shops, parking, etc. Location – A location with high foot traffic will be on everyone’s wish list when looking for a retail space for rent. This is the reason that renting spaces in popular shopping locations will increase the cost of the lease. Term of lease – Taking out a long lease (over a year) may put you in a better position to negotiate on the price. Rental condition – The more work you have to do to the space (in terms of remodeling or renovation), the less you’ll have to pay. Get ready to pay more if the rental space is in a condition that enables you to move in straight away. Competition – If there’s a lot of interest in the shop for rent that you have your eye on, it’s likely that the person who offers the most for the lease will secure the property. There’s no such thing as a one-size-fits-all lease. Different landlords will offer variations on a standard lease. The key distinction between leases is the costs that each party are responsible for. Single Net Lease – You will be responsible for paying property tax and utility bills. The landlord is liable for all other costs – for example, insurance. Double Net Lease – With this lease, the property taxes, utilities, and insurance are your responsibility. The landlord has to pay for maintenance. Modified Net Lease – Expenditure is equally divided between you and the landlord. Triple Net Lease – You’re most likely to be presented with this lease because it’s the most common type. A triple net lease states that you’ll be accountable for most of the expenses while the landlord will only be responsible for structural repairs. Settling on the size of the retail space requires you to consider your current needs as well as your future growth. This could be a tricky balance to strike as you don’t want to pay for too much space but, at the same time, consideration needs to be given to whether you’re willing to relocate when your business grows. Sales per square foot is an important metric to help determine the health of your retail business. This calculation could provide proof of your business’s viability should someone consider buying your business in the future. Getting the sales per square feet right will have implications for leasing a retail space and a potential future sale price. Insurance – You’ll need to cover your business for eventualities, like natural disasters and theft. The cost of insurance for a retail business varies widely and is normally worked out in relation to the size of the shop. Property taxes – The amount you’ll pay in property taxes will be dependent on your state. Utilities – Budget for the utilities that will be used in your business, including heat, water, sewer, and internet. Shared amenities – You may need to factor in costs for common area maintenance such as security, parking, and fire prevention. 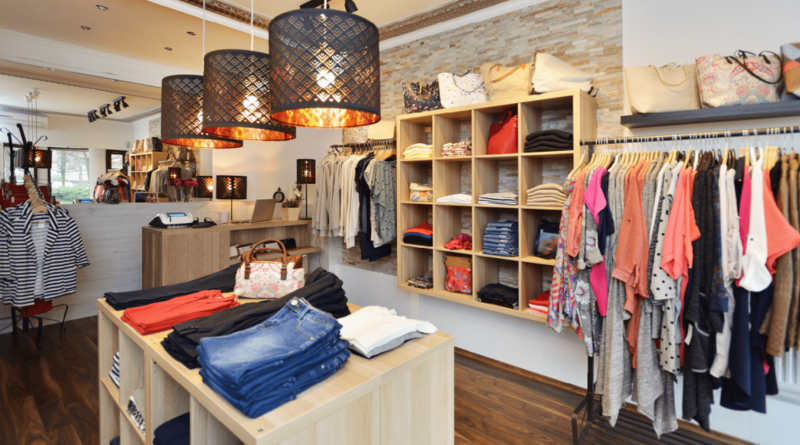 Remodeling – The shop for rent may be completely empty, so you’ll need to budget for interior design and visual merchandising. Take the annual cost of rent and divide it by your gross annual income to work out how much of your profits will be allocated to the payment of your lease. To help reduce the overall costs of leasing a retail space, think about leasing equipment and furniture. Not only will this keep the initial costs down, but it may also be easier to obtain financing. You should also consider using low-cost tools to help run your business after you’ve secured your lease. For example, Deputy’s workforce management software helps you to schedule your retail staff at a low cost. It’s never too early to start thinking about how you’re going to manage your staff. Book a demo today to see how Deputy’s cost-effective and efficient workforce management solution can help you when your retail store is up and running. You can search for a retail space for rent yourself. However, because of the high stakes involved, you may want to enlist the services of a commercial real estate broker. Use free online commercial brokerage sites, like LoopNet, to find shops for rent. Google “retail space for rent” in your local area to explore your options. You should exercise caution with this approach, especially if the listings aren’t with a reputable commercial property agency. Sign-up to a subscription site that provides a detailed analysis of important information such as demographics of the area. Subscription sites can be expensive – the costs range from $300 to $1000 per month. Ask people you know about retail shops for rent. Your network may be aware of rental properties that aren’t advertised with the big agencies. Have more contacts, so they’ll be aware of more rental properties. May have better negotiating skills and could secure a better price for your rental space. Can access commercial property subscription-only sites, which aren’t available to the public. If you choose to use a broker, use your state’s realtor association or the National Association of Realtors to find a reputable broker. In a safe area – It will be difficult to attract the right customers if your business is in a high crime area. Near your competitors – Having a location near to your competitors means that your ideal customers already shop in the area, so they’ll be interested in what your retail shop is offering. Close to major highways or public transport – An accessible retail shop removes a barrier to consumers visiting your shop. Next to comparable businesses – Retail stores, like shoe stores and apparel shops, complement each other. Ideally, your store will be located in an area with other shops that offer complementary products to your items. Although there may be a temptation to rush the decision-making process to choose a rental space, it’s best to take as long as you possibly can to make an informed choice. There will understandably be pressure for you to make quick decisions in areas where there’s a great amount of competition. But it’s better to take the time to get the right rental space than risking your business if you make the wrong call. After you’ve settled on a retail space to rent, you should be prepared to enter into negotiations to secure the best deal for your business. A lease is a legal contract and it’s recommended that you use a commercial real estate lawyer. Your lawyer can advise you about what different clauses mean and whether there are any provisions that could be detrimental to your business. You can check your state’s bar association to find a lawyer or you could ask other business owners for recommendations. Your broker can also make a recommendation for a lawyer. Some brokers have agreements with other professionals where they receive a commission for referrals. Ask your broker whether this is the case with the lawyer they’re referring. If your broker does receive a commission, it’s up to you to decide whether you believe that this recommendation will be the best one for your business. 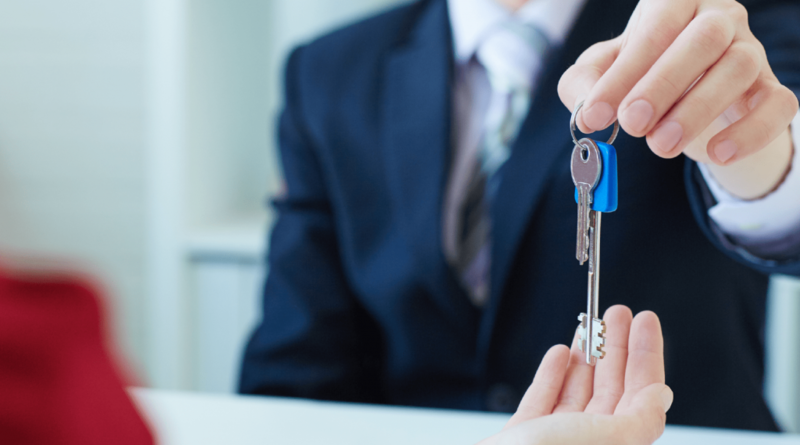 In relation to negotiating the price of your lease, a broker may be the best person to secure the lowest price. A handy tip is to hide your enthusiasm for the space. Even if you really like the shop for rent, show your broker and the landlord that you could take it or leave it because you have other options. Being too enthusiastic will be a signal that there’s no need to negotiate as the landlord may perceive your keenness as desperation. One of the three biggest outlays in a retail store is securing a lease, obtaining merchandise, and employing and managing staff. Deputy’s leading workforce management software is used across the globe to schedule, track time, and communicate with employees wherever they are. Try Deputy for free and see how it can assist you with managing your staff in your new retail store from day one. The post 6 steps to finding a retail space for lease appeared first on Deputy.